On this Throwback Thursday we’re looking back on Card Trooper. 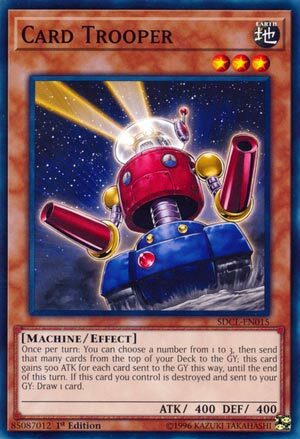 A mainstay in many top tier decks years ago, Card Trooper was one of a few monsters (Cyber Valley) to abuse Machine Duplication and cause massive advantage for you. Trooper had small stats, but its mill ability to get up to 3 cards into your grave each turn and pump itself up to 1900ATK for the turn was both a way to get a monster that avoided the popular Bottomless Trap Hole, fill your grave, and give you a good attacker made it an easy choice for almost any deck. Then, it was a 1-for-1 when destroyed and hit the grave. With Machine Duplication you could use each Card Trooper you summoned to mill up to 9 cards, then get a draw for each if you did something like Dark Hole the field just to gain the hand advantage. While the popularity of the Trooper Dupe move has faded, Card Trooper remains a stable card to use to get cards into the grave and not miss a beat when it leaves the field. Keeping up with Secret Rates we have Card Trooper for Throwback Thursday. It’s a Level 3 Earth Machine-type monster with 400 Atk and 400 Def. Once per turn for free, Card Trooper will send up to 3 cards from the top of the deck to the grave to let them gain effects and give itself 500 Atk for each card sent until the end of the turn. It’s a shame this doesn’t gain defense or last until the next turn. This effect is different from Dante because the cards are hitting the grave by effect, but that means when the effect is negated, nothing is milled whereas Dante is milling for cost and cannot be stopped. Anyway, Card Trooper also wants to give you a card when it’s destroyed and sent to the grave. Again, I wish it didn’t need to be sent to the grave, and newer cards don’t have restrictions like this anymore. So it’s completely versatile and not difficult to run multiples of since it is unrestricted now. You either get to mill or draw a card or both and might be a beater for a little while. Definitely worth considering as a tool for many decks especially Machine decks that still like Machine Duplication. Score: 3.25/5 Art: 4/5 Wall-E doing something useful in Yugioh. Throwback Thursday gives up the classic Troop-Dupe-Scoop card that recently came back to three for the first time since its release back in 2007, Card Trooper. Card Trooper is a Level 3 EARTH Machine with 400 ATK and DEF. Stats are fine considering Machine Duplication which was the other key part in Troop-Dupe-Scoop, I basically already said Machine is a good type for it, and EARTH is a good attribute all around. Once per turn, you can declare and send from the top of the deck to the GY 1 to 3 cards and this card gains 500 ATK per card milled. This plus Machine Duplication means 9 cards milled, even though the Card Trooper/Machine Duplication combo isn’t consistent enough for today’s meta unless the right deck comes around again. If this card you control is destroyed and sent to the GY, draw 1 card. Great replacement for itself, drawing cards is never bad unless you’re about to deck out. This made Card Trooper annoying to deal with back in the day as there were less ways to get rid of it without destruction. Card Trooper is a solid card even by today’s standards, even if the Troop-Dupe-Scoop isn’t as good as it was back in the day. If your deck likes milling, Card Trooper is worth considering. Art: 4/5 I typically think the artworks of Jaden’s cards that weren’t Elemental HERO or Neo-Spacian related were pretty cool. Card Trooper, a card that defined a Format…or two…or more. Hard to believe this card is so old, and been up and down the Ban List. Currently down, at unrestricted status. Card Trooper does a LOT of things right, and what he does, he does well. A 400 atk Monster who dumps (up to) your top 3 cards to become 1900 for a turn, and even replenishes himself with a Draw when destroyed? Yea, he’s a sneaky little thing, isn’t he? For any Deck, relevant or not, that likes to mill, Card Trooper is for you. He’s still good, and helps a lot…Dark World, Lightsworn, Chaos…anything that’s pro Graveyard can make love to Card Trooper down by the fire. Use and abuse, cause remember kids, no card is ban/restricted worthy until it’s abused. All joking aside in that line, still a tremendous card. He was certainly overrated (and I stand by that) even at the top of his game, but you can’t argue with results I suppose.